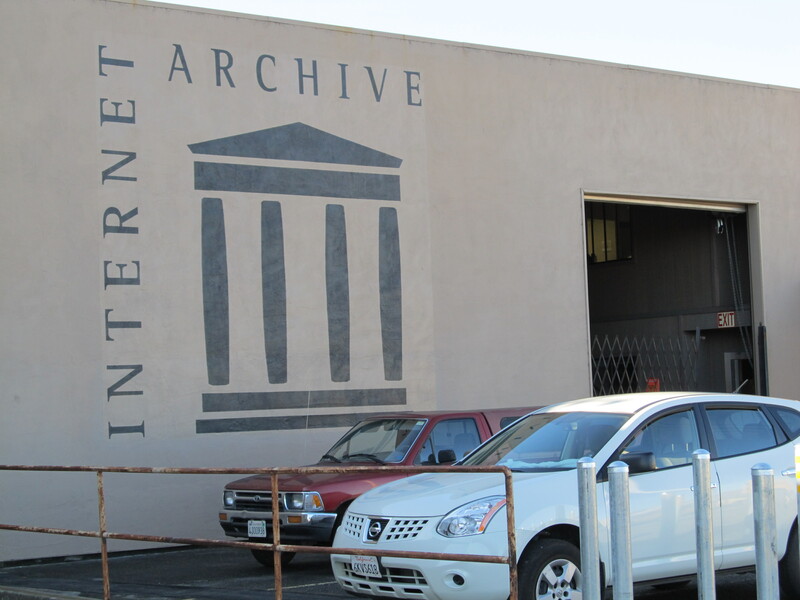 I made a pilgrimage of sorts to a scruffy industrial section of Richmond, CA this week as I delivered 265 books from the Wine Library to the Internet Archive‘s physical archive. A cold breeze blew through the tanker cars on the railroad sidings across the street from IA’s warehouse at the east end of Florida Street and rattled the warehouse security gate . I pressed the doorbell on the steel door. As the dolorous strains of a Christmas carol chimed within, Mark Graves, the facility manager, appeared to open the gate and welcomed me to IA. He brought over an empty pallet by forklift to the back of my pickup and we loaded my eleven boxes containing wine-related materials mostly dating from the mid-1800s through 1923. These out-of-copyright works will be scanned and become part of IA’s growing catalog of digitized materials. We will then add the links to the MARC bibliographic records in our Horizon catalog as well as derive records for display in CONTENTdm. Roughly half of the pre-1923 (the copyright cut-off date) materials in the collection have already been scanned by IA or Google; we will go through the same process with them. Also included in the delivery were 26 oral history transcripts of interviews conducted by the Wine Library Associates. We will pair them up with the original audio (in in some cases video) recordings in CONTENTdm in a new Winemakers Oral History Collection. Both these groups of materials are part of the grant-funded effort to digitize as much of the Wine Library’s materials as practical — including books, pamphlets, photographs, wine labels and more. Much of the Library’s holdings are still under copyright, of course, and likely won’t be available digitally, but our project will make a significant part of Sonoma County’s wine history available electronically. Mark Graves was kind enough to give me tour of the facility. The headquarters are still in San Francisco, but IA acquired the Richmond building a year ago to replace the Oakland warehouse they were leasing to provide not only processing and server space, but also space to physically archive every book that they could get their hands on. As IA founder Brewster Kahle wrote in his blog last year, “Internet Archive is building a physical archive for the long term preservation of one copy of every book, record, and movie we are able to attract or acquire.” Many of these — particularly out of copyright, but also “orphan” works, for which the copyright owner is unknown — will be available through the Open Library program. The physical books donated to IA are cataloged, scanned, boxed and stored in shipping containers stacked two high in the warehouse. Sonoma County Library has recently joined Open Library and will be contributing some number of de-accessioned books. Although there is room for a big crew at the Richmond facility, only three people were at work when I visited — Mark and two catalogers faced with an overwhelming number of books. He showed me the future offices and a partially assembled scanning machine, but said the process of moving operations and materials had been very slow. The actual scanning is done at various satellite scanning locations — our books would be taken to San Francisco. Quixotic? Probably. Necessary? Yes. The recession hit IA as hard as many other nonprofits, but they are determined to continue their mission of archiving and making accessible the written and electronic record of our times. I’m glad that we are able to support them even in small ways through our project. Check out the gallery of images from IA.